We’ll have a page dedicated to the challenge where you can sign up and leave comments. Plus, we’d love to have a review of the stores you’ve found and liked (we ignore stores with bad service or stock), we’ll post it with a description of you and a link back to your blog (if you have one), just e-mail it to me at kim@bookstorepeople.com. In fact, we encourage cross posting bookstore reviews so post on your blog, Indiebound, Yelp, City Search, City Guide and any other place that would like it. We’ll Give out a Prize! But wait, there’s even more, at the end of the year we’ll have a random drawing among everyone who satisfied their challenge for a gift certificate from BookSense. What more could you want? Sign up now and start exploring the wonderful world of independent bookstores. I’m going to join this challenge at the “Type A Personality to the Max” level, because if you look at the list of challenges I’ve joined for 2009, you’ll know I definitely qualify for that category! This entry was posted in Bookstores, Challenges on January 26, 2009 by Robin. The only two independent bookstores anywhere near me are well known to me (one is my favourite coffee-ing place) and being disabled and without a car anywhere further afield is difficult. There are so few independent booksellers left in England nowadays – it’s very sad. What a great challenge. 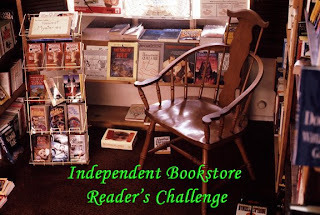 I have wanted to try to discover more independent bookstores in my area (I only know of 4) and this challenge is a great motivator. Thanks also for posting to the link to the website for The Bookstore People. Scriptor, I’d love to have a bookstore/coffee shop close by me! You’re lucky to have one that close to you. I agree that it’s very sad that there aren’t many independent booksellers these days. Molly, doesn’t it sound fun? An excuse to visit some new bookshops! Robin, we’re so glad to have you with us on the Challenge and are looking forward to hearing about who you discover! Molly, we’d love to see you! Scriptor, one of the reasons we started the blog is because the bookstore/coffee shop close to us shut down, cherish yours! Thanks, Kim! I’ll be posting soon about an independent bookstore we visited today! JoAnn, that’s a great link to Mr. B’s! I’d LOVE to go there! J.Danger, I’m completely out of control this year. I think I snapped.